The human animal is the worshipping animal. Toward the divine, we have a need to pray, to sacrifice, to offer up, and to praise. From the spirit dances of primitive animism to the rational contemplation of philosophical paganism, from the ethical code of the rabbis to the theological vision of the scholastics, from the sprinkled blood (the origin of blessing) of temple cults to helping the poor in simple Christian charity, men need to relate the immanent and the transcendent -- they see their particular lives in time and space transfigured and transfused with meaning unbounded by human things. Religion is this aspect of human life where the everyday and worldly intersects with the ultimate and divine. Is this an accident of human evolution, or is it a racial neurosis brought upon us as conscious beings who live in the shadow of our own death? Is it a reflection of the divine order, where creatures naturally orient themselves toward their source? Has God revealed himself to us, as the Christians claim? In this realm, I shall try to delve into such questions as an Orthodox Christian who ever pesters God with "Why?" By trade, Harvey is a showman, and his peculiar homage to the Lord has some clever and amusing parts. I especially like his fish fry bit. It is difficult to pull off the comic and pious simultaneously, but Harvey accomplishes it rather well. What I find somewhat troubling, though very familiar, is the audience’s response. There is something very Dionysian in several strains of American Protestantism—and we cannot simply attribute this to the “excitability of the colored folk” as some people claim who are not familiar with religious traditions born from or heavily influenced by the spiritual feverishness of the Great Awakenings. If you have ever been to lily white charismatic congregations, you feel the same energy—the same rush to lose oneself in the mob—in the “One” of the moment. Though from youth I was very familiar with “holy rollers”—as my mother calls them—since her family is full of such Christians, I never realized this connection until I attended a black worship service held in a local high school assembly hall. I did so due to a “multicultural” assignment for class. I had recently read The Birth of Tragedy wherein Nietzsche proposes his distinction between the Apollonian and the Dionysian, and, behold, I saw his words brought to life in the pagan pulsing of the congregation’s singing, dancing, shouting, and general blending into a unity where distinctions and separations blurred. This is the Dionysian impulse in man—that hunger for submitting oneself to the boundlessness that transcends the distinctions between the self and the other. Pagan worship from many cultures is replete with such Dionysian activity, and it has reentered many Protestant religious traditions in the last two centuries. In contrast to the Dionysian, the Apollonian force creates and orders such that one can see the parts and their relation to the whole in art and in life. The Apollonian esteems distinctions, and it exhibits logic in relating those distinctions. Both the Apollonian and the Dionysian deal with music—as the language of the soul—but they refer to different aspects to music and to their effects upon human beings. The Apollonian brings order, causality, and connections into the consciousness, whereas the Dionysian smashes the mind’s interest and ability to perceive those relations. For Nietzsche, human beings—as great art and as full life—require both the Apollonian and the Dionysian, and he argues that the Greeks maintained this necessary balance in their civilization, the epitome of which was Greek tragedy. However, Nietzsche contends that Greek culture devolved in the Hellenistic age following the Socratic revolution in philosophy and the Euripidean moment in drama, both of which attacked and sought to expel the Dionysian element from art and from life. Thereafter, Western culture has suppressed the Dionysian and promoted the Apollonian. For Nietzsche, the malady of Western man after the Enlightenment was a consequence of this imbalance, and he hoped that the stirrings of the nineteenth century might once again resurrect the Dionysian power too long dormant in the world. If you consider the Western fascination with primitivism, from that time until today, Nietzsche certainly tapped into the Zeitgeist of a decaying West. From Wagner to the Nazis to rock and roll, from theosophists to the New Age hippies to Wiccans, from Gauguin to Picasso to the multiculturalists of today, we see a desire to return to the pagan springs of the soul. It is possible that such is a reaction from many quarters to the suffocating Apollonianism of modern rationalism. In religion, I take cold, bloodless, intellectualized Calvinism as the most notable disembodiment of harmony between the Apollonian and the Dionysian. It is purely Apollonian, where the emotive, the bodily, and the thirst for transcending the self have been expelled as pagan accretions to popery. This most distilled form of Protestantism rids Christianity of all “religion of immanence”—and religion itself. It turns faith into propositional assent and the Christian life into social morality. In other words, it is a unique form of godless Stoicism interpreted through the languages and imagery of the scriptures. If we agree with Nietzsche that men need both the Apollonian and the Dionysian, then we would expect such Apollonian Christianity to destroy itself. Nietzsche claimed that Christianity in toto was such a denial of the Dionysian, but then he was the son of a Lutheran pastor in Kantian Germany. Perhaps, the incredible secular energy of Calvinist societies resulted from such starvation . . . just as the celibate Shakers showed themselves quite industrious, as well. Imbalances can lead to some striking achievements. Nonetheless, the eruption of the Great Awakenings and the charismatic movements along with the neopagan ragings of contemporary society may all be reactions to the stifling Apollonian character of Protestant civilization. If such is true, then the Bacchic tendencies shown in Steve Harvey’s audience might be the result of an untempered rejection of Apollonian sobriety. The dam broke, and the flood of irrational emotion so evident in hot tent Protestantism crashes upon the souls of its adherents, sweeping them to and fro in the sea storm of modern pietism. If we need balance, we find none in such chaos. The pendulum has swung in the opposite direction. Some months ago, on John J. Miller’s radio webcast Between the Covers, Miller interviewed Anne Rice on her book Called Out of Darkness, which you can hear here. You may know of Anne Rice by her Vampire Chronicles series. Her “prodigal” story is fascinating and moving, and the interview is worth your time. After two thousand years of such testimonies, I still find them extraordinary. Rebellious children return to their forgiving and patient father, reenacting over and over again the parable in life lived and in life suffered. These stories remind me of the line from the film Shadowlands where Lewis and one of his students share an intimate learning moment wherein Lewis states that we read to know that we are not alone. It is quite a striking thesis that has continued to move me whenever I reflect upon it. How obvious it is that human beings from all ages and lands face the same limitations, turmoils, temptations, and pains, and, yet, we in our self-absorption easily forget to remember that insight. Encounters in books with the struggles of other souls remind us of this truth and assure us that, yes, indeed, our particular path has been tread before and that, yes, groundless hopes may yet be more than irrational flights into the fog of unknowing night. Of course, such consolation comes only with trust in the speaker, and the lack of that trust is what underlies our fearful alienation and restlessness in the first place. Nonetheless, faith becomes more acceptable, at least to me, when buttressed by the concrete supports of fellow pilgrims’ experiences. For such a contribution, I am thankful for Anne Rice. It is fitting on Boxing Day to honor a great Englishman. G.K. Chesterton was a fine wise man and quite a gift to modern English speaking people. He wrote in a wide variety of genres, including those of the crime solving sort, such as his Father Brown mysteries series, where the sleuth is an English priest. John J. Miller has a series of radio webcasts called Between the Covers on the National Review Online, where he interviews writers about their books. Earlier this week, Miller interviewed voice actor Kevin O’Brien on his book on tape production of The Innocence of Father Brown. You can listen to the interview here. I enjoy most of Miller’s interviews—he is quite a genial man, both online and in person, at least in the multiple talks and symposia that I have attended with him present. Yet, O’Brien comes across as more personable and humble than most of Miller’s guests—perhaps because he, as a dramatic interpreter, is more of a servant to a text than a creator. Hybris often accompanies creation, though I have known several intolerably arrogant actors in my life, as well. Perhaps, O’Brien is simply a good Christian who finds humility easily. Anyway, O’Brien has several interesting bits to say about Chesterton and his beloved Fr. Brown. I like that O’Brien’s company is called Theater of the Word Incorporated—with a stress on the incarnational aspect of incorporated. To incorporate comes from the Latin word incorporare—to embody. I wish them well in their attempts to inject traditional Christian nutrients into the veins of American culture. Merry Christmas to the New Calendar Folks! For everyone out there who celebrates the birth of the Lord on the Gregorian calendar . . . I wish you a lovely and joyous festive holiday. And it came to pass in those days, that there went out a decree from Caesar Augustus that all the world should be taxed. (And this taxing was first made when Cyrenius was governor of Syria.) And all went to be taxed, every one into his own city. And Joseph also went up from Galilee, out of the city of Nazareth, into Judaea, unto the city of David, which is called Bethlehem; (because he was of the house and lineage of David:) To be taxed with Mary his espoused wife, being great with child. And so it was, that, while they were there, the days were accomplished that she should be delivered. And she brought forth her firstborn son, and wrapped him in swaddling clothes, and laid him in a manger; because there was no room for them in the inn. And there were in the same country shepherds abiding in the field, keeping watch over their flock by night. And, lo, the angel of the Lord came upon them, and the glory of the Lord shone round about them: and they were sore afraid. And the angel said unto them, Fear not: for, behold, I bring you good tidings of great joy, which shall be to all people. For unto you is born this day in the city of David a Saviour, which is Christ the Lord. And this shall be a sign unto you; Ye shall find the babe wrapped in swaddling clothes, lying in a manger. And suddenly there was with the angel a multitude of the heavenly host praising God, and saying, Glory to God in the highest, and on earth peace, good will toward men. And it came to pass, as the angels were gone away from them into heaven, the shepherds said one to another, Let us now go even unto Bethlehem, and see this thing which is come to pass, which the Lord hath made known unto us. And they came with haste, and found Mary, and Joseph, and the babe lying in a manger. And when they had seen it, they made known abroad the saying which was told them concerning this child. And all they that heard it wondered at those things which were told them by the shepherds. But Mary kept all these things, and pondered them in her heart. And the shepherds returned, glorifying and praising God for all the things that they had heard and seen, as it was told unto them. It is Yuletide in Cincinnati, and, yesterday, I did the traditional downtown Christmastime annual tour with my mother. On the corner of Eighth and Plum Streets are four Cincinnati landmarks: the city hall, the Roman Catholic Cathedral of Saint Peter in Chains, the Isaac Wise Plum Street Temple, and an old Protestant Congregational church that has been turned into an office building. The Latin cathedral and the Jewish building face each other across Plum Street. As we arrived at the corner, we noticed a sign set up on the steps of Saint Peter in Chains that read, “Happy Hanukkah from your Catholic Neighbors.” I smiled and thought an “only in America” internal cliché. My mother had never before seen the beautiful Isaac Wise Temple, and I had hoped that it would be open, but all of the doors were locked. So, we visited the city hall and the cathedral. Upon leaving Saint Peter in Chains, we saw a fellow across the street open up the central doors to the synagogue. He also set up a sign out front that read something like, “Merry Christmas to the parishioners of Saint Peter in Chains from Isaac Wise Temple.” I smiled even more and knew that Tocqueville would be proud. Simple acts of goodwill go very far in creating an environment of tolerance and trust among people of diverse backgrounds, beliefs, and interests. Thoughtful gestures cannot substitute for virtue and reason, but they definitely help. So, kudos to the parishioners of Saint Peter in Chains and to the congregation members of the Isaac Wise Temple. Would that the nation follow their lead instead of seeing every holiday as a turf battle in the multicultural wars. Today is December 6 on the Julian calendar, which is the feast of the beloved Saint Nicholas. There is no shortage of information on the internet about the true Santa Claus, whose name is a linguistic corruption over time of Saint Nicholas. Read about the saint on the parish site of Oxford’s Saint Nicholas. The Saint Nicholas Center has a lot of information about the saint and about the pious traditions involved with his feast around the world. The Saint Nicholas Society and the Saint Nicholas the Wonderworker site have some neat offerings, too. 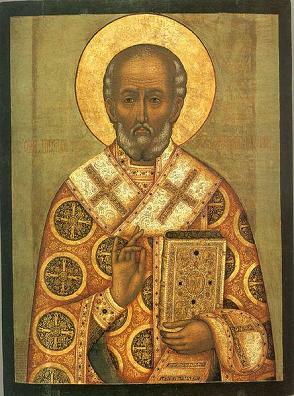 Saint Nicholas was the bishop of Myra, the metropolis of Lycia, in Anatolia. Myra is now Demre in Turkey. Italian sailors moved (stole) Nicholas’ relics to Bari in southeastern Italy in A.D. 1087. The Italians took advantage of the chaos that ensued from the Mohammedan hordes’ conquering that part of the empire. You can visit the Basilica of Saint Nicholas in Bari, as well as the original Church of Saint Nicholas in Myra. I would like to know how the origin of Santa Claus has been forgotten. Perhaps, the film’s makers should visit an Orthodox parish on the Saint Nicholas’ feast day. a model of meekness, and a teacher of temperance. Therefore thou hast won the heights by humility, riches by poverty. 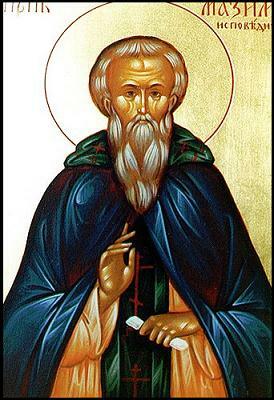 Holy Father Nicholas, intercede with Christ our God that our souls may be saved. Thou wast a faithful minister of God in Myra, O Saint Nicholas. thou didst die for the people and save the innocent. Therefore thou wast sanctified as a great initiator of the grace of God. This evening, I had a discussion with a Protestant acquaintance of mine about religion. I assume that he is from a black Baptist background, but I am not sure. He asked what religion I was, and then he asked me if I worshiped Mary like the “Catholics” whom he knows. I responded that neither his Roman friends nor the Orthodox worship Mary, though we honor and venerate her. He further wanted to know if we had statues of her. I said that we have icons or images of her. He asked why we did so. There are many possible responses to his questions, from scriptural passages (e.g. all generations will call her blessed) to reflection (she gave birth to and raised Jesus Christ), but I went the casual route and replied with a question of whether or not he respected his mother and had pictures of her in his house. If the saints are the family victorious, then doesn’t it seem proper to keep them in our memory and to show them honor? In true low church American fashion, he said that the Bible tells us not to respect people differently but to treat everyone the same. I suppose that he was referring to Paul’s statement in his epistle to the Romans that God is no respecter of persons. I am no Pauline scholar, but I suspect that the modern radical tendency to demolish all distinctions is at work with such an interpretation rather than sound Biblical hermeneutics. It seems more likely that Paul means that there are no “privileges” in God’s justice. It cannot mean that God’s dealings with human beings are the same, as scripture, tradition, and experience show us that providence is highly customized to the individual. Beyond God’s economy, such advice to humans is absolute madness and would be quite sensible grounds for discarding Christianity as an insane social malady. We are called to love everyone, but we cannot treat them the same way. Such irresponsible behavior would destroy society, and it would furthermore be a grave injustice. In my discussion with the Protestant, I gave the example of two men: Charles Manson and a physician who has spent his life working to heal others around the world, as those doctors in Médecins Sans Frontières. Think of what real equitable treatment of both men would mean. We would just as soon entrust a psychopathic murderer with the care of loved ones as we would a living example of the good Samaritan? We would hold them up equally as models for our children to emulate? We would be equally likely to allow them to stay as a guest in our house? You are just an idiot if you think that we ought to treat both men equally. It is a simple matter. As Christians, we are called to love both—and this is in itself quite mysterious, as both men are not equally lovable. One standard Christian response to this obvious objection is that we are lovable because God loves us, not that we are loved by God because we are lovable. With men, we love lovable things—we respond as lovers to the good of things already in existence. In contrast, God’s love causes things to be lovable. Yet, God’s actions are not inconsequential; if we are loved by God, then that truly makes us lovable and valuable—in nature, due to God who creates us in love. In Augustinian excess, certain Christians go to extremes to avoid Pelagianism in rendering human beings worthless and in pretending that God’s actions have no relationship to the reality of God’s creation. They introduce a bizarre Manichean division in reality between God’s intentions and the natural world that he creates and sustains—it is one of the worst aspects of Reformation heresy. We can see a similar relationship with baptism. In normal baptism, the water (through God’s grace) purifies us. Yet, in Christ’s baptism by John in the Jordan, the presence of Christ purified the waters. Yet, the waters truly were purified; we do not simply pretend that they were because of our respect for Christ. So, if it is true that God loves all men equally, and I am not even sure that such is good doctrine, though it is widely believed, then I do not know how we can rationally understand it. For me, it is something that I cannot understand, and I simply trust that, if true, there must be a good reason for it that I cannot see. Perhaps, God’s love for us is for us as we should be—our idealized persons in conformity with his will. In such a sense, God’s equal love for us might make sense. Yet, it is a very dangerous road to tread when we begin to consider our idealized forms in the mind of God—what we should be—as our “real selves” in contrast to their particular manifestation, here and now, in what we actually are. Such was the way of the Cathars. Yet, it seems that this is practically what people claim when they state that God loves us all equally because we are all equally men made in his likeness—as if God only deals with us on the essential level and not as creatures struggling for our own perfection in history. Christianity is not Greek philosophy, even the best of it. The Gospel appears to concern the personal, not simply the universal, of mankind. The Protestant disgust for Marian piety may be rooted in modern egalitarianism; the Reformation was the seed of the so-called Enlightenment. So, if we can safely discard that we are to treat everyone equally as if people really were equal—an intolerable falsehood—then our honor and veneration of Mary, the Theotokos, makes more sense. For she is the model human being, who represents for us the ideal human response to God—in humble, loving submission to his will of pure goodness. She is the chief personality in Jesus’ family, both by blood in Palestine two thousand years ago and by spirit, in the Church, now and forever and unto the ages of ages. From the beginning, Christians have honored her. It is strange and disturbing that so many heretical sects could develop that interpret Marian piety as mariolatry. I have no doubts that the Theotokos is far better than I am in spiritual development, proximity and communion with God, wisdom, purity, and in just about any other conceivable way. That someone should have the same disposition toward her as toward me is unsettling. However, I wonder how Protestants who object to the honor traditionally given to Mary would really respond to her presence. Perhaps, their foolish disrespect is all abstract nonsense. If a Calvinist makes it to heaven, how will he treat the Mother of the Lord? It is a fascinating thought. My Protestant interlocutor asked me why it seemed to him, at any rate, that Roman Catholics treat Mary as if she were as important as Jesus himself. I told him that not even they really believe that, though some of their practices give such an impression to outsiders. I said that for the West and for us, Mary is a guidepost to God. We are to manifest God among men through our lives, and the Mother of the Lord serves as our role model. In praising her, we praise God whom her soul magnifies and in whom her heart finds joy. Andrew has a theory about the Latins’ emphasis on Mary that gives the Protestants the impression of mariolatry. He thinks that after the Counter-Reformation, the cult of the saints in the West dwindled. However, the honor and respect given to the Theotokos remained. With such an occurence, Mary no longer appears as the champion leader of the Church victorious, being the preeminent witness of the redeemed Christian life among many. Instead, she represents the saints by herself. Thus, the respect and honor in the Christian community for the host of saints channels to her alone, and this imbalance makes her seem like an appendage to the Trinity among the Romans, at least to outsiders. I do not know how accurate Andrew’s theory is, as, until recently, popular devotion to the saints in the West continued. Maybe, he judges the West from the post-Vatican II environment that he knows. I am not sure. In the sermon today, the priest talked about various titles given to the Theotokos. What struck me was the military imagery used in some liturgical poetry—our champion leader, invincible champion, might unassailable, and the like. I know that many academic feminists from Roman backgrounds are interested in the Virgin Mary; I wonder what they think of the Mary as field marshal of Christendom. Protestants might claim that to see therein the Athena pagan impulse at work, and perhaps they are somewhat correct. Paganism is simply natural religion; pagan rites and beliefs spring from the human encounter with the world and with the divine in the world glimpsed rather dimly. I do not find the transition of popular pieties from paganism to Christianity problematic. Rather, I see it as a confirmation of the Gospel. With respect to the Hebrews, Christ came to fulfill the Law, not to replace it. I believe that something similar is at work universally; the Gospel redeems and transforms all human things, from reason to culture. Natural human religion and the popular expression thereof get baptized in Christianity. Jack Chick and his ilk fret over the moons of Isis and Artemis making it into Marian symbolism, whereas I see the hopes, yearnings, and strivings after God among the heathen completed in the fullness of time. Human beings are naturally awed by sexual purity (in itself and as a symbol of purity in general), by the life-giving power of pregnancy and of childbirth, and by the unfathomable tender love of a good mother for her children. Reflection from the dawn of time on such matters likely resulted in the pagan deities and the cultic observances attached to them. In the Theotokos, these primeval human concerns manifest in the center of God’s providential nexus; Mary is the Ground Zero of God’s plan of salvation, in all the primitive and archetypal imagery thereof. If you have been checking the English speaking world’s intellectual and spiritual pulse over the last decade, you may have noticed a resurgence in atheist propaganda. From best selling books to political activities, the atheist block has come out of its closet and now brazenly flaunts its heathenism for all the world to see. Just this last week, I wrote about the D.C. atheist campaign for Christmas. When I was a student in Paris, I was struck by the hostility with which religion was treated by many folks. I had discovered the French revolutionary laïcisme, and I witnessed public attacks of Christianity that I would not have imagined possible. The scorn, hatred, and disgust for religion in otherwise decent, cordial people shocked my Midwestern piety. I knew atheists back home, but they were young disaffected social rebels on the fringes—and they were wise enough to keep their blasphemous rumors to themselves lest they create public outrage. However, when enough folks realize that they are not alone, their numbers embolden them to overcome their cowardly reticence. We are now seeing the fruits of atheist liberation, I suppose, and instead of bath houses, we have book stores, coffee shops, and the “grassroots” organization of the Democratic Party. Not all of the écrasez l’infâme crowd self-identifies with the Left. For the Right—in America, at least—has many liberal roots, and liberals from Jefferson to Mill to the crowd at Reason Magazine today have proven ever inhospitable to the religious proclivities of their countrymen. Moreover, the Nietzschean component of the American Right, which overlaps the liberals to some extent (as with Rand and her idolaters), introduces further hostility in the Right’s relationship to the preachers of the slave morality. A new discussion site, Secular Right, provides a meeting place for those enemies of Leftist collectivism who feel a bit left out of the communal warmth of most American conservative pow wows. John Derbyshire and Heather MacDonald are among the contributors to the page. I have enjoyed the lively reaction that the site has elicited in the right-leaning blogosphere. What’s Wrong with the World, the National Review Online, Lawrence Auster’s View from the Right, The American Conservative, and others have commented on their renegade compatriots. Secular Right is still too new for me to pass judgment, but the posters’ initial foray into the public square has largely focused on emphasizing their specific difference—through assaults on religion and on religious conservatives. It is as if they are finally airing their pent-up frustrations about all those annoying Christians with whom they grudgingly must cooperate to keep the socialists at bay. I have not written about atheism much, yet, though it certainly is an interest of mine. Some years ago, I coined what must be the case for some of us in the fold—we must go through life ever surrounded by the temptation of nihilism. Michael Novak has written many thoughtful articles on atheism. I recommend “Christmas Atheists,” “Lonely Atheists of the Global Village,” and “Letter to an Atheist Friend,” written to the aforementioned Heather MacDonald. I especially appreciate that Novak describes various species of atheists in his “Christmas Atheists” article; the reasons and motivations behind people’s opinions are much better indicators of their intellectual and spiritual state than their “positions” are. I would much rather a man be an unbeliever hostile to Christianity who is nevertheless wholly committed to finding the truth than an apathetic cultural Christian for whom the greatest questions and matters hold no interest. With the one, his response matches the importance of the object; with the other, he might as well be a cow—for he is bovine with respect to matters divine. This is excusable in cattle, who glorify God not through contemplation but perhaps through chewing the cud. For a man, it is a ghastly condition. I, myself, do not think that most self-proclaimed atheists are really atheists. Most of those folks simply hate Christianity and do not find in the term agnostic a strong enough revolt against the established spiritual order. Agnosticism is for wussies; a real man denies God outright. I do not casually interpret an intellectual movement with such blasé psychoanalysis, but much personal exposure and experience indicate that most modern American atheists trace their theological opinions to personal or emotive hostility rather than to the sound reason and scientific rigor that they constantly intone with hallowed sanctimony. Much of the criticism of the Secular Right site points this out, as well. Folks with otherwise sound reasoning and habitual commitments to truth radically depart from their normal sober course when matters of religion appear; such incongruity in a character betrays something irrational in the works. Yet, my assertion that most atheists are not truly atheists goes beyond a reductive psychoanalytic dismissal. For I hold that the only true atheists are nihilists, and few people are truly nihilists. Consistent nihilism does not seem to be a possible intellectual or practical stance in human life; we have to accept some sense of identity, of consistency—of order—to assert and to do anything. Haters of Christianity assume the title atheist for themselves, but they restrict the meaning of the divine to the Christian or Abrahamic paradigm. Universally, the divine is the highest thing, or non-thing, in one’s understanding, or misunderstanding, of reality. Christian haters like Christopher Hitchens or Richard Dawkins are not atheists because they implicitly and explicitly believe in an order to reality. Anyone who figuratively “bows before the altar of science” thereby truly acknowledges a god. This god may not be a personal god of traditional Western religion, but it is an order, principle, or matrix of laws that causes, explains, encapsulates, or provides the setting for the whole. An angry “atheist” may accuse me of doing violence to semantics, but he thereby refuses to think outside the Abrahamic box that he so much despises. A more honest man would conclude that a rejection of God was a rejection of reason, of metaphysical and physical principles, of values and identities that we have no right to assert and cannot prove. Such an honest man turns the antinomies of reason viciously against their old Prussian expounder himself, not content to leave science, empiricism, or other pet epistemological domains protected against the powerful and all consuming, including self-consuming, NO of nihilistic hermeneutics. Such an honest man might therefore feel the need for something in the absence of being, and he might, therefore, without basis and justification call for the will to create its own rules, values, principles, and order. He pegs everything on the will, but he knows, and admits, that nihilism robs us even of the will—and of the self. Futilely heroic becomes his tragic dirge in praise of damned man. This man, more than anyone, can claim to be an atheist—but he does so with anguish; for he knows what the nothing does to the mind. I love this man, and I think that he can instruct those who have ears to hear. Yet, few have such ears. Patriarch Alexy of Moscow and all Russia died this morning. Memory Eternal! You can read his obituary on ITAR-TASS and in the Times. I found Metropolitan Hilarion of New York expressing what I and other children of the Russian Orthodox Church thought when we learnt the news: “It is noteworthy that Metropolitan Laurus and Patriarch Alexy both reposed this year, having already achieved the main task of their lives.” For Metropolitan Lauras died seven months ago, and the re-establishment of communion between the Moscow Patriarchate and the Russian Orthodox Church Abroad occurred last year, ending eighty years of separation due to Communist theomachy and to the repression of the Russian Church. A council of all the bishops and of representative priests and laymen must elect a successor. It will be the first time that a united Russian Church elects a patriarch since the patriarchate was reestablished in A.D. 1917, with the election of Saint Tikhon. As such, we hope that it will finally put the Soviet years to sorrowful but instructive memory. It is odd that the Moscow Patriarchate, the Russian Orthodox Church Abroad, and the Orthodox Church in America all lost their head bishop this year. Several weeks ago, I wrote on boring Church politics, where I mentioned that Church elections are not that important—no primate will succeed in betraying the apostolic tradition. Even Sergius generally safeguarded the faith. However, I also mentioned that the prospect of Metropolitan Kirill of Smolensk as the next patriarch worries me; for I fear what headaches he would cause. I also wonder how strong the new bonds between R.O.C.O.R. and Moscow actually are—someone like Kirill may exacerbate tensions in the Church Abroad and cause more parishes to go into schism. Let us hope and pray that the council elects a godly man who will shepherd the Russian Church well. Speaking of primates, I just read this week an interesting speech by the O.C.A.‘s new Metropolitan Jonah, given earlier this year when he was still an abbot, which concerns the role of bishops in general and primates in particular—“Episcopacy, Primacy, and the Mother Churches: A Monastic Perspective.” It is worth reading. It is refreshing to hear a bishop of such standing speak frankly about issues, though he delivered them while still an abbot. His words about Constantinople are rather shocking—shocking that he actually said them; for everyone knows them to be true. I also appreciate the speech’s Christocentric message and its emphasis on the pastoral role—the telos, really—of Christian bishops. On the whole, it is an insightful and powerful message, and the O.C.A. is fortunate to have such a bishop on the eagle. However, there is an element of Protestantizing within the O.C.A., possibly from the O.C.A.‘s acclimatization to the religious culture of the United States, as has most definitely occurred among American Roman Catholics . . . you know, the pope’s Calvinists. Metropolitan Jonah’s words in this speech remind me, at certain points, of anti-clerical rants among Protestants. In “The Episcopacy: A Monastic Perspective,” he sounds awfully close to Seventh Day Adventists. Self-criticism is important, but I fear that his dismissal of seventeen centuries of ecclesial life, with respect to the bishops, goes a bit too far. Undoubtedly, it is easier to live the life of the Gospel as marginalized, persecuted fringe elements. When society becomes Christian, leaders—and regular folks—have to juggle the demands of their faith and the demands of survival in a political community. The inherent difficulty in managing this tension of responsibilities is what underlies Christians’ rejection of Christendom, from Tertullian down to our own day. Yet, such difficulty also indicates an opportunity, and it was this vision of a Christian polity that inspired some of the greatest men of the last two millennia. Saving one’s soul in an isolated cell has its own challenges, but it is not, and it cannot be, the only Christian life. With any scenario, from Diocletian persecution to imperial “symphony,” there are challenges, temptations, and blessings. Metropolitan Jonah’s cheerleading of the O.C.A. is also somewhat unfortunate. He says that with the O.C.A.‘s autocephaly in 1970, all other jurisdictions became uncanonical. Yet, the whole situation, including, one could argue, that very granting of autocephaly, was uncanonical. The hellish complexity of the twentieth century is not easily reduced to the O.C.A.‘s fancied image. A truly autocephalous local national Church will only be possible in Western lands with the consent of all, or almost all, of its Orthodox Christians and of the other autocephalous Churches around the world. Political machinations are part of the secularization of ecclesial authority that Metropolitan Jonah’s speech condemns, and, yet, are we to believe that Moscow’s tome of autocephaly in 1970 should have magically cleared up the horrible mess that resulted from the Bolshevik revolution? I do not wish to insult anyone from the O.C.A. Good, pious Christians dealt with the unprecedented crisis in various ways, and it would behoove us to refrain from judging one another. However, when the O.C.A. proclaims itself the real representation of Orthodoxy in the Americas, it implicitly states that everyone else erred in their handling of the twentieth century and that the appropriate, canonical choice for everyone now is to climb aboard the Syosset ecclesiological train. It will take much time and maturity to rebuild a unified Orthodox structure from the wreck that the Communists wrought. American Christians who have drunk too much Samuel Adams, literally and figuratively, of the beer and of the man, need to focus their energy on building the true unity of the Church—in the Christian life, not in external administrative organs, while crying about self-determination and repeating the slogans of that wretched blasphemer Thomas Paine. Until Orthodox Christians in America put aside their ethnocentrism, their pseudo-papism, their pseudo-Protestantism, their progressive and American hostility toward tradition and authority, their wariness of monasticism and the ascetic life, and their loyalties to their ancestral homelands that they put ahead of the Church, we shall not see an American Orthodox Church, and that is a good thing. Today on the Julian calendar is the feast of the Entrance of the Theotokos into the Temple, one of the twelve great feasts of the Church. She [Anna] cared for the child for months. When the child turned two years old, Joachim said, “Let’s take her to the temple of the Lord so we can relate the message we were given.” And Anna said, “Let’s wait until the third year, so that she will not seek her father or mother.” And Joachim said, “Let’s wait.” When the child turned three, Joachim said, “Let’s call the pure women of the Hebrews. Let them take up lamps and light them so that the child will not turn back and her heart will never be led away from the temple of the Lord.” And they did these things until they went up to the temple of the Lord. And the priest welcomed her. Kissing her, he blessed her and said, “The Lord God has magnified your name for all generations; through you the Lord will reveal deliverance to the children of Israel in the last days.” And he set her down on the third step of the altar and the Lord God poured grace upon her. She danced triumphantly with her drinks and every house in Israel loved her. You can listen here to a talk by Fr. Thomas Hopko on the feast. Comment by Joseph at "Putin's Family Values versus the Emasculation of American Men"
Comment by Pavel at "Putin's Family Values versus the Emasculation of American Men"
Comment by Tyler at "Dolores O'Riordan: Ar dheis Dé go raibh a hanam dílis"
Comment by Joseph at "Dolores O'Riordan: Ar dheis Dé go raibh a hanam dílis"
Comment by Mark Citadel at "Run, Lindsey, Run!" Comment by Mark Citadel at "Already Disappointed by Trump"
Comment by Joseph at "Already Disappointed by Trump"
Comment by Mark Citadel at "Eighth Anniversary"
Comment by Mark Citadel at "Peter Hitchens on Russia"
Today on the Church calendar is , (new calendar: ), in the year of our Lord, .